“Gentlemen should die by the time they are my age”, says my 80 year old patient. He is indeed a gentleman- one who is slowly wasting away and losing his ability to remember what he had for breakfast this morning, or how to use the toilet, while retaining the ability to speak fluent French and tell me of his many accomplishments during his professorship years. I ask him if he is still enjoying things in life and he tells me not so much, that ennui has become his pastime. Then he proceeds to tell me that he is living out the play by Molière, Le Malade Imaginaire. He chuckles. I, of course, can’t quite remember the significance of this comment. I ask if the play has a happy ending. Oh yes, he says, for the man does die. 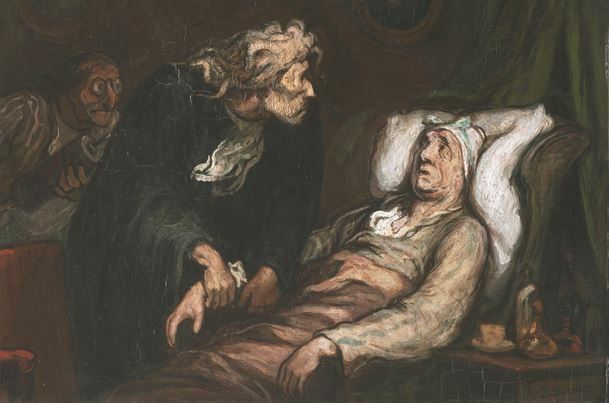 (After looking up the history of this play, I discovered that Molière, the playwright, while acting the main role of the hypochondriac Argan, on February 17th, 1673, fell into a fit of coughing during the final scene and died that night. My patient-professor, of course, still knows the immense irony in all of this.) I am amazed by the ability of one with advancing dementia and debility from a stroke to recognize the incongruities in life, and find humor in it. Being human, I ponder again the unfairness of life. Such a brilliant career and a mind that recalls more than I have learned in my lifetime in a man who is being physically and mentally returned to the infant stage… I want to scream out loud, “STOP”. I struggle with the undignified regression of this lovely man. I am sad each time I see him, that a little more of him is gone. Yet he doesn’t know, and can’t quite comprehend my concern. I would love to have been his student, many years ago, this professor of life, but I am so glad to be his student now… remembering to stop, ponder, and sit with him, in awe of life’s simple pleasures. There is a season, and a time, and a purpose. This entry was posted in hospice story and tagged attitude, dementia, living in the moment, loss, seasons. Bookmark the permalink.